Have you ever wanted to fly like a bird? Aerodium is the free flight simulator, first vertical wind tunnel in Eastern Europe. Fulfill your dream of flying! You will be picked up from your hotel and driven to Aerodium. The strong air stream (200 km/h) of the wind tunnel lets a person fly by lying on it. By changing body position, the laws of aerodynamics enable you to soar into the skies, to perform any movements and acrobatics and to experience unbelievable emotions. The Aerodium serves as unique entertainment for seekers of new emotions, groups of friends and families. Almost anyone can fly. If you are physically healthy and aged between 5 and 75 years, weighing 20 - 110 kilograms (44 – 242 pounds) and have dreamed about flying, you're welcome to start. 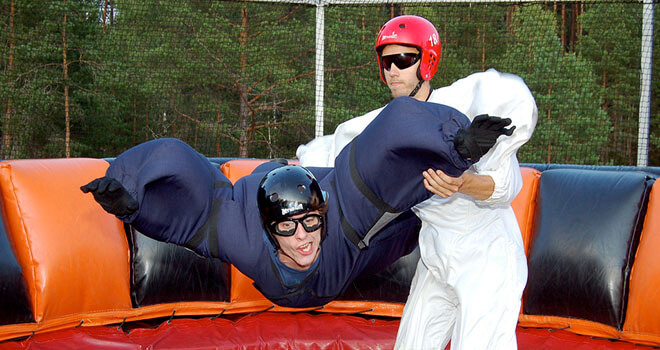 Flying suits will not fit a person taller than 2 meters (6 feet 6 ¾ inches). You need to wear light clothing, in which you feel comfortable and can move freely. Footwear with flexible soles is mandatory, but no sandals or shoes with open toes - the best would be closed sports footwear. Rain, wind and snow do not affect flying in the wind tunnel. During storms, when the air is highly electrified or any other dangerous weather conditions, flights will not be operated. Depending on the situation, flights are postponed to either later the same day or to a time that is mutually agreed with guests. Before flight you will hear a safety instruction and then you can enjoy 2, 4 or 6 minutes flight. After Aerodium you will be taken back either to your hotel or old town of Riga.